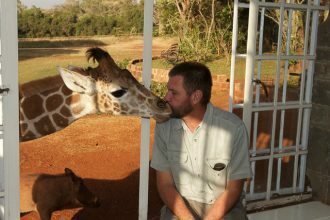 Ruyard Kipling wrote a wonderful book – Just So Stories explaining various mysteries including how the leopard got his spots, and how the rhino got his skin. 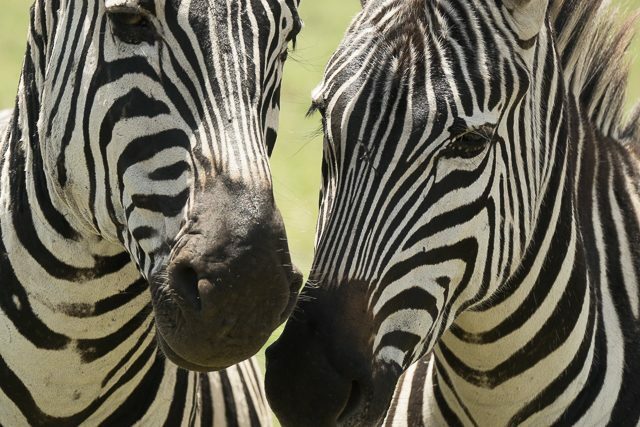 However he never dared explain why zebras have stripes. 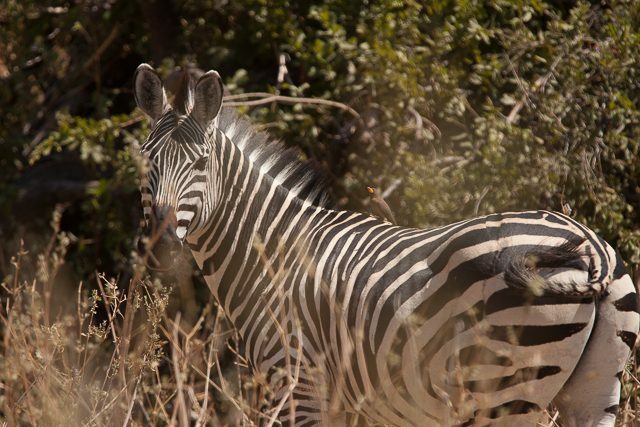 Almost wherever you go on an African safari you will see zebras. They are everywhere. 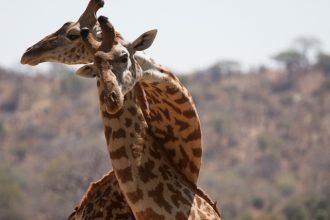 However they are almost unique among African mammals in that they are not camouflaged to blend in with their surroundings, but stand out, to our eyes at least, as if advertising their presence. 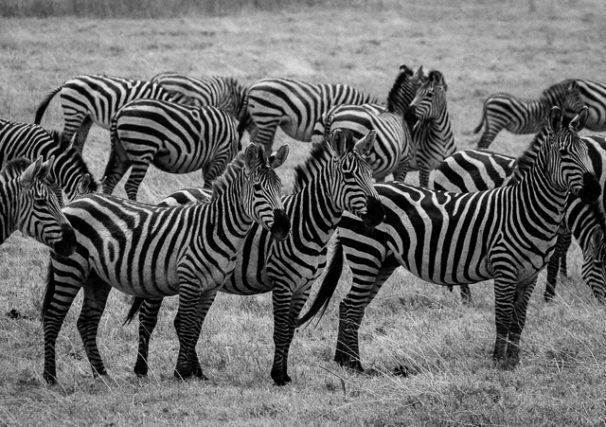 Why do they have stripes? 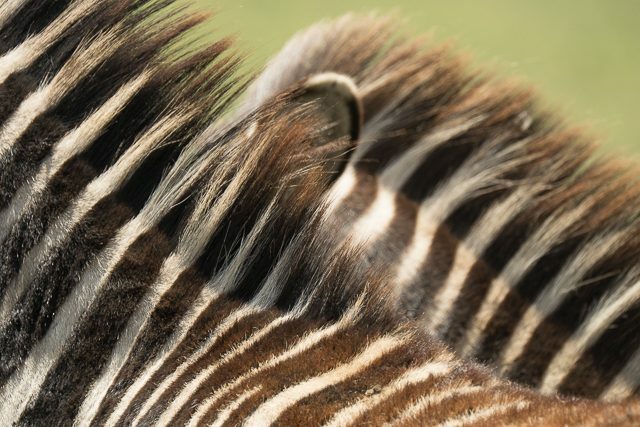 Perhaps they evolved to blend in with long grass or bush in some habitats and to avoid predators, like the kudu, bushbuck or okapi that have some form of stripes simulating dappled shade. 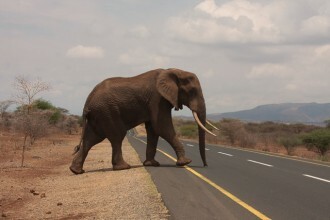 However when they are on their preferred habitat, open grasslands, they are as conspicuous as any other large mammals. 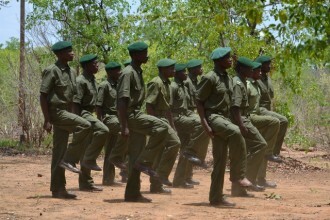 They may even be more conspicuous, not just to that timeless African predator – Man, but also their other main predators who have better night vision – lions and hyaenas. 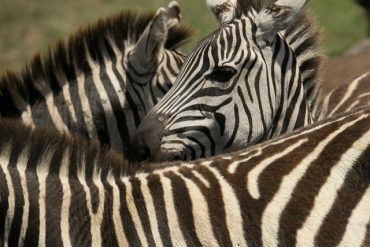 Another possibility is that their stripes make it hard for a predator to distinguish between one animal and the next – the stripes blend a group of zebras into a fuzzy whole entity. 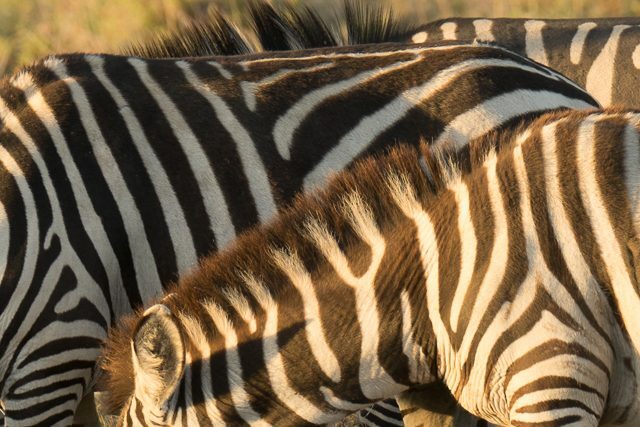 However if that were the case so many of the other large African prey species would have similar conspicuous and confusing stripes. 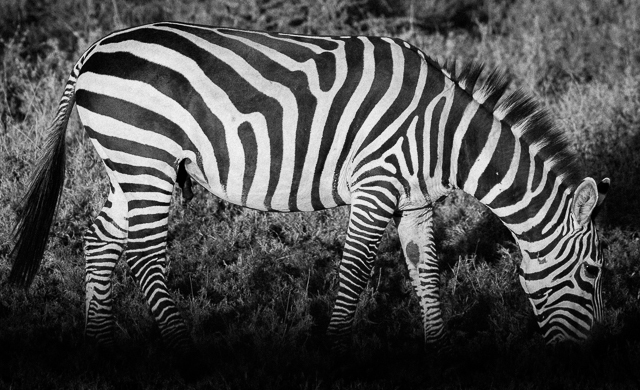 But no, zebras are almost unique in their colouration. 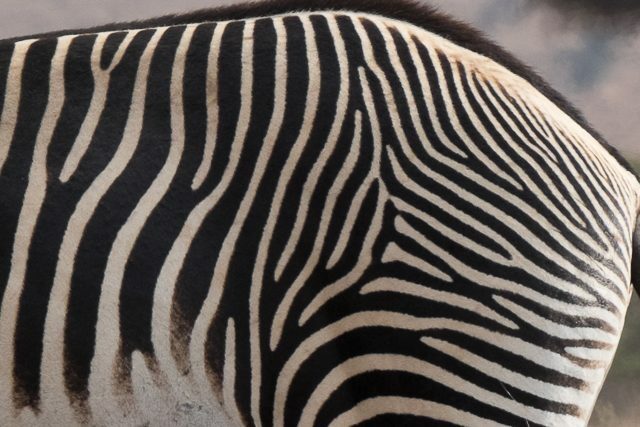 Another suggestion is that the stripes could promote air flow on their backs, as the black areas would absorb heat and the air above these would be warmer, and the white areas would reflect light, and harbour cooler air. 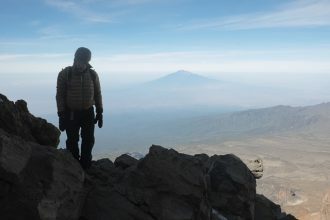 The difference in air temperature would start tiny air flows as the warm air expands and rises and the cool air moves in to fill the less dense space. This mini flow would aid body cooling. However this has not been proven. 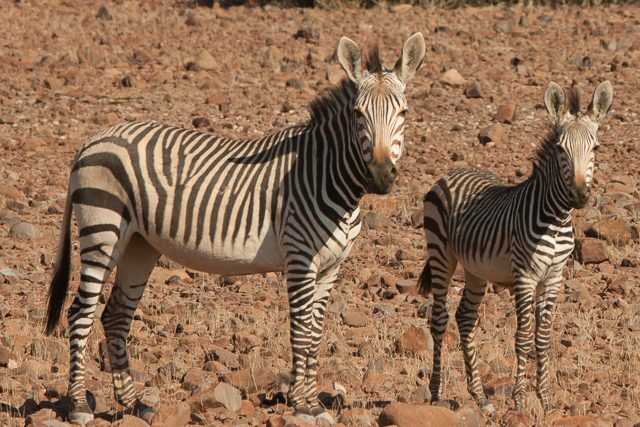 Anyway, if that were the case, and if it made enough difference, why aren’t there more species with stripes in hot areas? 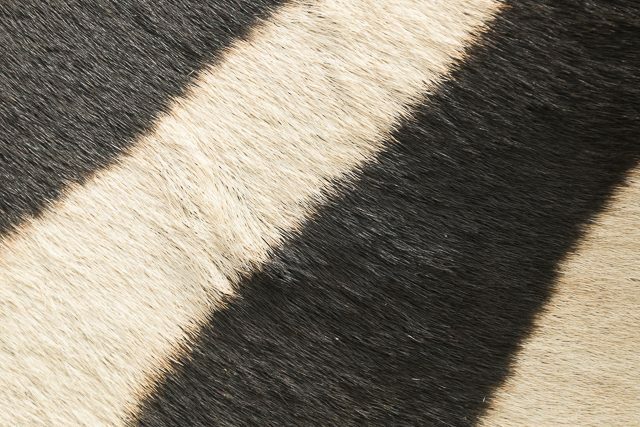 The oryx (such as the gemsbok) does have contrasting dark and white areas, but does not have stripes. 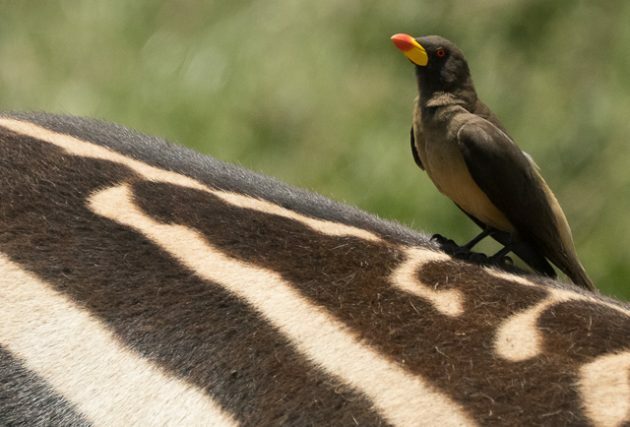 A team of biologists recently (in 2016) published arguments from a study into this mystery, and they consider that the most likely reason is to reduce harassment and disease from biting flies such as the tsetse fly. 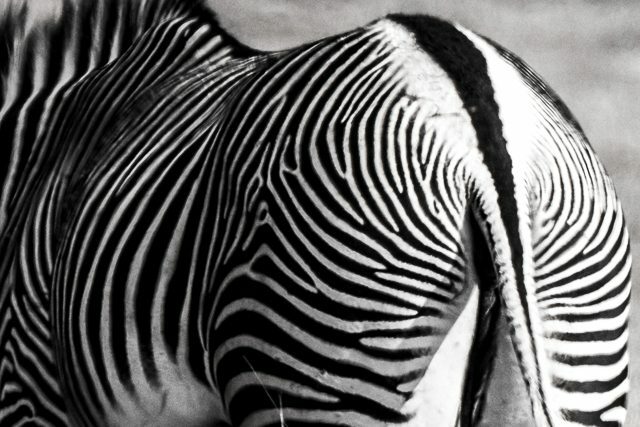 They found that the insect eye would be confused by contrasting light from the stripes, making them avoid those areas. 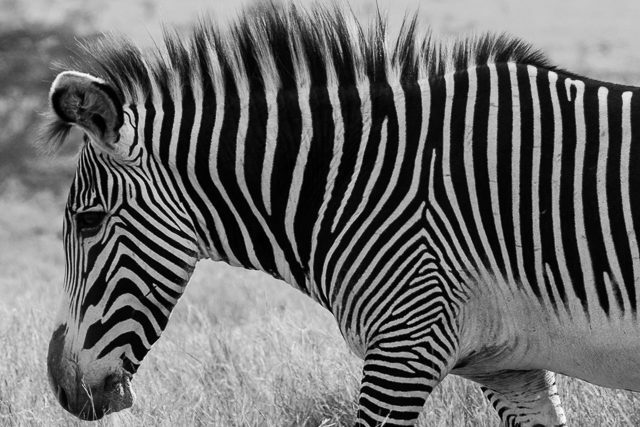 They concluded that the highest incidence of biting flies is in the tropics and that is why wild horses did not evolve stripes. However the vast steppes of Asia are notorious for biting flies during the summer months. 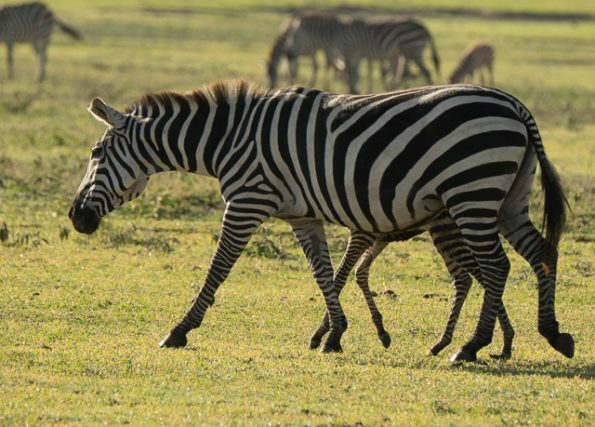 Did these wild horses (there are almost none left so we will never really know) once migrate away from these areas in the summer and so, because they could escape the flies, they did not evolve stripes? 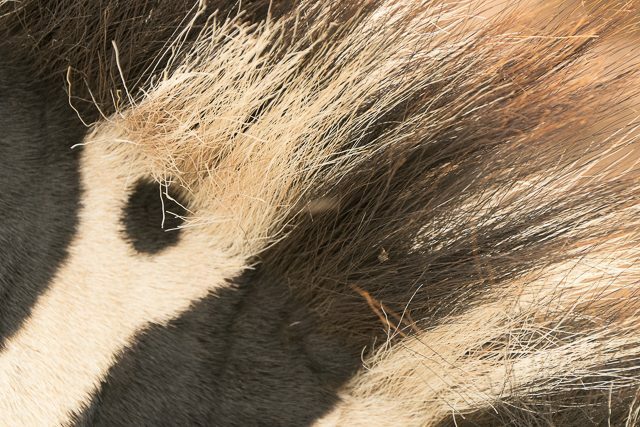 Or have these Eurasian horses not been effected by disease transmitted from horseflies as badly as large African mammals are effected by the tsetse fly? 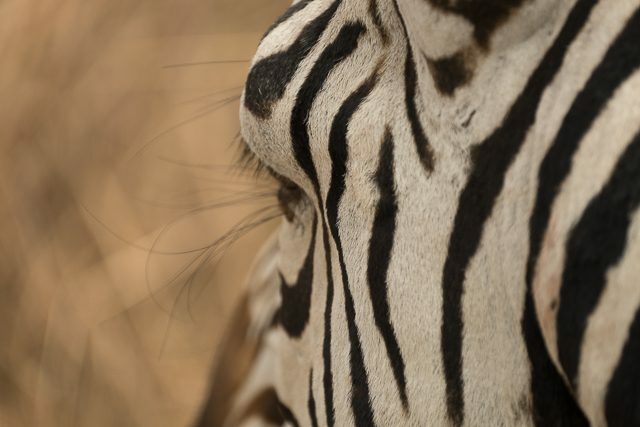 It is strange that generally zebra stripes are broader on the rump and belly and narrowest near the face. 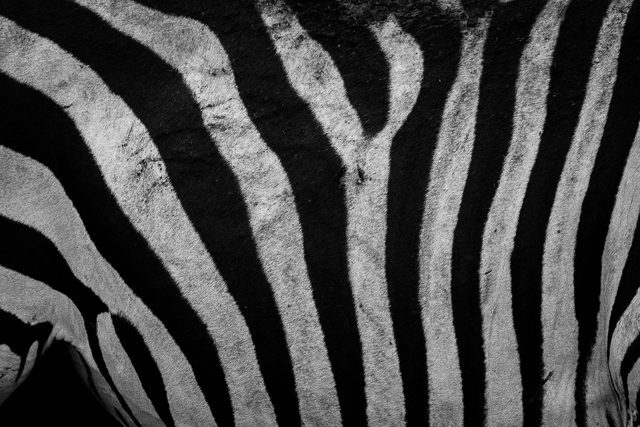 So the mystery of the zebras stripes will remain so for a while, providing a continued challenge for researchers to delve into this further! 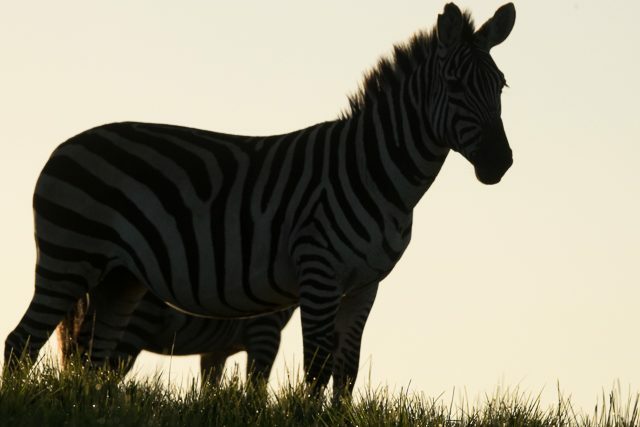 Zebra facts – There are three main species. 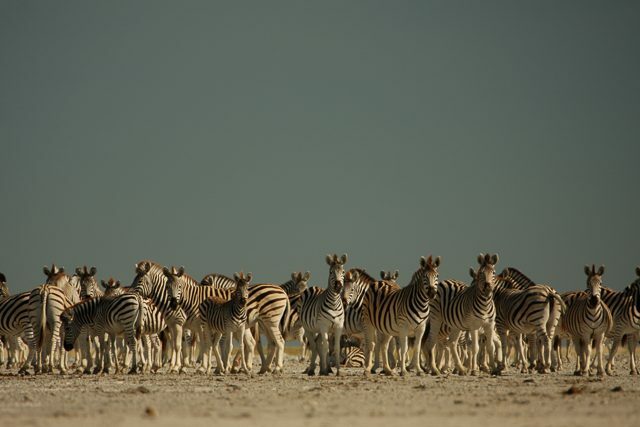 The Plains zebra (Equus quagga), which used to be called the Burchell’s zebra in East Africa, is the most widespread and least threatened of the wild horses on Earth. 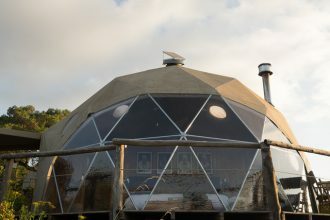 It occurs from in the Sahel belt south of the Sahara throughout eastern and southern Africa to northern Botswana and Namibia. 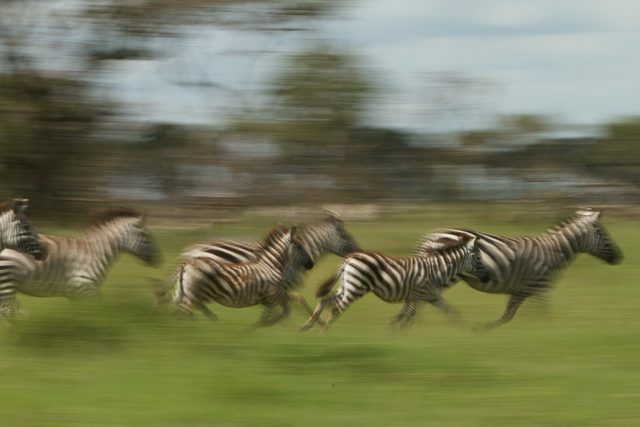 Huge migrating numbers are seen in some areas, such as parts of Botswana, and of course in the Serengeti where a quarter of a million zebra migrate throughout the year! 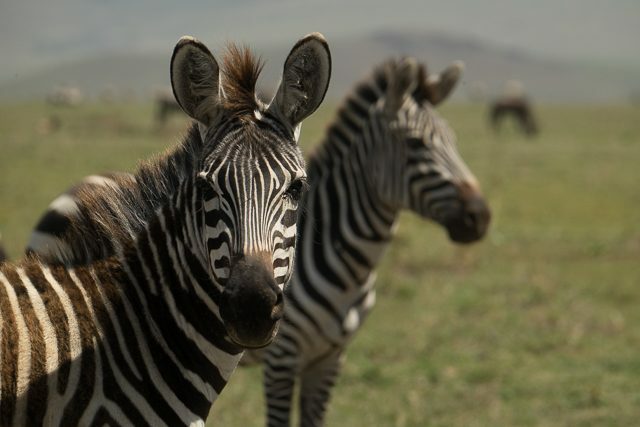 The Grevy’s zebra (Equus grevyi) is one of the most endangered species, now surviving in a couple of places in Ethiopia, and thankfully doing quite well in some reserves in northern Kenya, where not more than 3,000 remain. 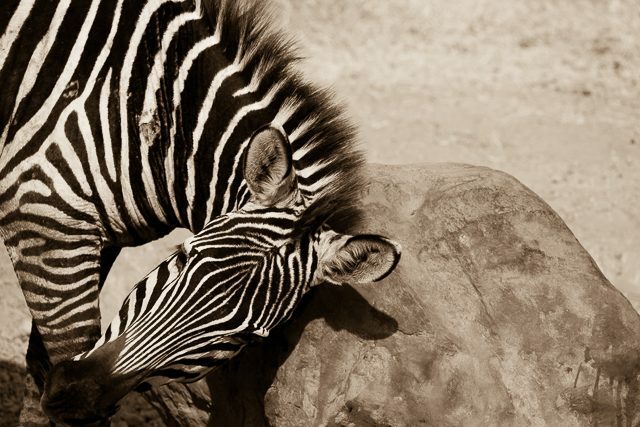 The Mountain zebra (Equus zebra) used to roam throughout southern Africa, and is now split into two distinct populations – one in the deserts of Namibia and the other in the Cape area of South Africa.